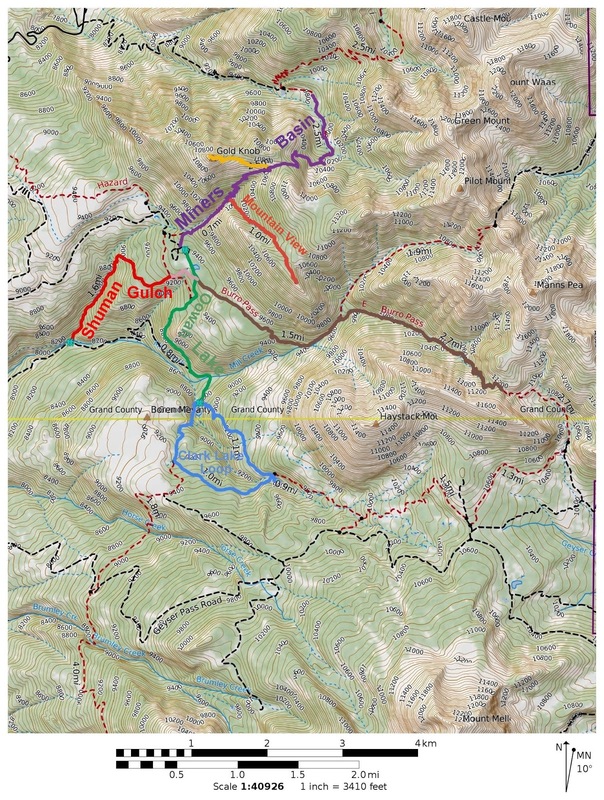 The Gold Knob trail is located in the La Sal Mountains near Moab, Utah. Gold Knob begins near the 1.4 mile point of the Miners Basin trail as it nears the crest of the ridge before dropping into the basin on the north side of the mountain. From the top of Gold Knob there are outstanding views looking out over the areas surrounding Moab including Arches National Park, Canyonlands National Park and Dead Horse Point State Park. Almost directly below are some of the most incredible views of Castle Valley that can be seen from most anywhere else. The trail begins off of the Miners Basin trail about 1.4 miles from the Warner Campground. While the trail is only about a half mile long the total round trip distance from the closest trailhead, which is at the Warner Campground, means the real round trip distance for the trail will come out to about 3.8 miles. 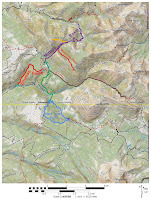 With the campground being at an elevation of around 9500 feet the total elevation gain comes out to 1,534 feet. After turning off of the Miners Basin trail the route to the summit of Gold Knob can be seen almost in its entirety. There are nice views looking south as you hike through the open areas of some of the other peaks of the La Sal Mountains as well as the Abajo or Blue Mountains near Monticello, Utah. The last bit of trail leading to the summit is reminiscent of many other summit assaults that get steeper near the end. Although on this day the air was calm and pleasant summits and ridgelines can often be very windy. Gold Knob tops out just over 11,000 feet so other than during the summer months it can get quite chilly. The view of Castle Valley seems to catch the eye almost immediately causing one to fixate upon it. The iconic pillars of the Priest and Nuns rock formations are in the foreground of this photo. The Colorado River can be seen winding its way through the canyon in the background. Porcupine Rim forms the western edge of Castle Valley with the Sand Flats Recreation Area to the left of it and Arches National Park to the north. Looking in the opposite direction are some nice views of the La Sal Mountains with the highest point in the range being Mount Peale (12,726). There are a dozen peaks in the La Sal Range that top out over 12,000 feet. There are many 5 star views from the summit of Gold Knob. To get there you will need to hike the first half of the Miners Basin trail but the total distance still comes out less than 4 miles and that's not too bad at all for the world class scenery. We might be a little biased because we have hiked and biked almost every trail around Moab and have spent years looking up at the La Sals. Gold Knob is a great place for looking out and reflecting on all of those other places. It is also a very popular trail with the locals so that says something for it also. If you would like to see it for yourself then all you have to do is 'Take a hike'.